Q: Assuming perfect health, and 5 months’ training notice for all three, who do you like to win a challenging cross-country 5k race — Kennedy Kithuka, Lawi Lalang, or Edward Cheserek? Cheserek’s recent championships, coupled with his devastating kick, make him a tempting selection. But let’s not forget how dominant Lawi Lalang looked in 2011, or how much of a world-beating revalation Kithuka was in 2012. Jim: After the way he handled Kennedy Kithuka in Terre Haute & put the hammer down on Lawi Lalang at NCAA Indoors, I’d be a fool not to pick Edward Cheserek. I am not sure if either Kithuka or Lalang had been nursing injury coming into those races, but the Oregon freshman looks unstoppable on the cross country course and from 3k up on the track. 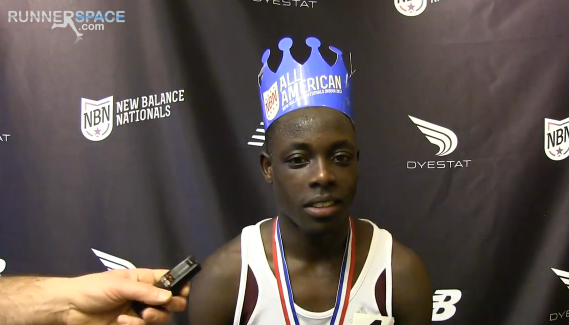 I guess the question now is, how long will Cheserek stay on top. Lawi has the talent and it wouldn’t be too surprising to see him battle Cheserek during outdoors. You can never count out a guy who’s run 3:52 for the mile and right at 13 minutes flat for 5000m. It will be interesting to see if Oregon doubles Cheserek at 5000m & 10,000m at NCAAs. So until proven otherwise, all hail King Ches. 2) They didn’t even put a clock on the screen. 3) They had no information on splits at all, so was Mo gaining on Mutai or not? Who knew? 5) They cut to Farah passed out, and the commentator didn’t even know who this was, or whether this was live or recorded. Didn’t he have a producer talking in his ear? 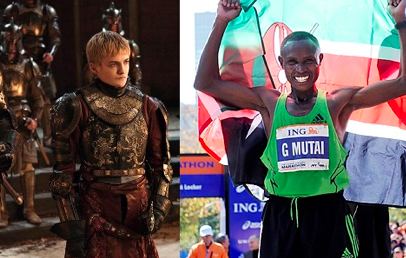 Also it’s Geoffrey Mutai not Joffery Mutai, which brings me to how excited I am about season 4 of Game of Thrones. Racing over long distances on the road should be an exciting sport. There’s cut and thrust and tactics but this is lost on the viewer if all you do is show the leader and talk about how smooth he’s going. He’s going at the same speed as the bike in front so it shouldn’t be hard to say is the leader speeding up or maintaining his speed at the least. As for the race itself Mutai is awesome but that’s not news. Don’t know what to make of Mo. He’s looked better over the half with 10k training. I think we just have to wait till 13 April and see what happens. Jim: First, I wanted to say thanks for not dropping any Games of Thrones spoilers. I’m a little afraid to admit that I haven’t watched a single episode and fear that I may be losing a bit of my geek cred with this admission. That being said, I’ve thought about reading the books instead. So I can trump the TV watchers, by being one of those “the books are so much better” snobs. Back to your comments and question. Any knowledgeable fan of the sport, me included, feels almost exactly the same way you do. How can broadcasters make what should be an exciting race and make it too painful to watch? When a big local network secures the rights to these races, including the NYC Half, they want to appeal to regular TV viewers and the details that make all the difference for knowledgable fans of the sport are completely overlooked. They dumb down the coverage of the professional event and focus a good deal of camera time away from the things that matter to us. So they break away to the a reporter who’s standing live on the course with some random borough politician or show the back of the packers enjoying a stroll through Central Park. These details like knowing split times and whether the gap was closing between Mutai & Farah would have made the NYC Half so much more engaging to watch. So until these details are deemed important we suffer through terrible coverage. As for the pronunciation of Mutai’s first name, it appears that they were going by the book. Q: Let me qualify this question by stating that I understand that every country in the world except one would kill for the results that US men have have in the sprints (100m & 200m) over the last six years. I’m simply coming at this from the idea that we are currently 2nd globally in men’s sprinting and I want to see us get back on top. Having said that, I feel like the state of American men’s sprinting is a bit concerning based on our very high standards. I did some research and found that, from 2008-2013, US men won 10 individual sprint medals at the major championships (5 silver, 5 bronze and, of course, 0 gold). In only one of those events (the 2008 200m) did we earn more than one medal. More concerning, of the six men who earned those 10 medals, only one (Curtis Mitchell, 2013 200m bronze) will be under 30 when the 2016 Olympics begin. A look at the national championship results shows similar results. Since 2010, runners who will be under 30 in 2016 only placed in the top three in the 100m twice, while doing so five time in the 200m (though only two of those performances were sub 20.00). So at long last, here is my question. As we look ahead to the next batch of major championship years (2015-2017) who are the young, male sprinters most likely to rise to the top for the U.S., and can any of them legitimately challenge the Jamaicans for gold medals? There are a few guys I happen to like to root for, but none of the young crop stands out to me as clearly headed for stardom. 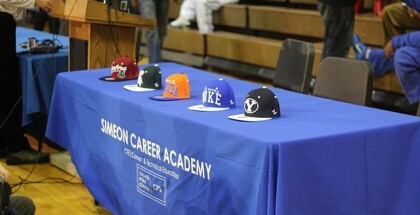 Please tell me onto which bandwagons I should jump so I can look smart when making Olympic picks in a couple of years. Thanks and keep up the great work at the Daily Relay. Jim: Fear not, Jason. It appears that there are a few young US sprinters that have made their presence known in 2014 and could be medal threats in future major championships. Marvin Bracey left Florida State last year to pursue sprinting full-time. Bracey is only 20 years old and ran a quick 10.09 last summer. At this year’s IAAF World Indoor Championships, Bracey finished with a silver medal in the men’s 60m dash, only .02 away from the world title. Trayvon Bromell, a freshman at Baylor, tied the world junior record at 100m running 10.01 (+1.5) at the Texas Relays. At only 18 years-old, it’s scary to think how fast this young guy could run if he stays healthy and motivated. Last but not least is Florida junior Dedric Dukes, who ran a 19.97 200m into a headwind this past weekend at the Florida Relays. 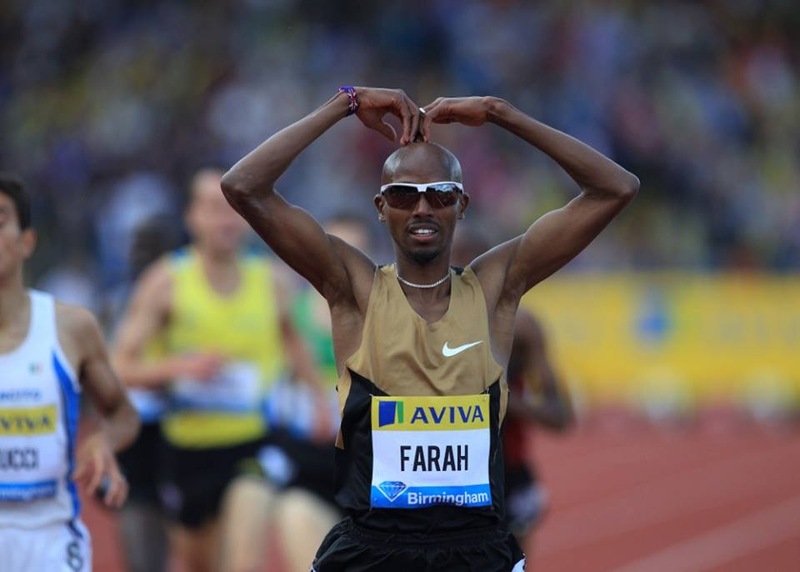 1) Who positions higher, Farah in London or Hall in Boston, bet off if either DNFs? 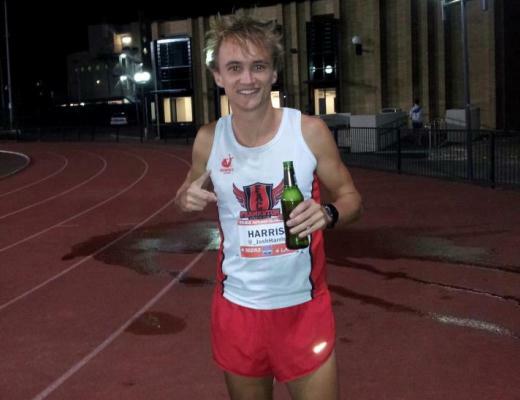 2)Do more Brits in London, or Americans in Boston go sub 2:10? 3) At what mile does the winner of London hit the front for the final time, over or under mile 23? Jim: You’ve constructed some interesting questions there, Dan. I’ll start off by going with Mo Farah over Ryan Hall. I’m always a bit hesitant with first time marathoners, but after watching Bekele over the weekend I’m feeling ok with picking Mo Farah. Plus there’s the fact that Ryan Hall hasn’t completed a marathon since the 2012 Olympic Trials. I would love to see Ryan Hall prove me wrong, but I’m not willing to pick him. Now this next question is where you’re getting tricky. Unless there’s a massive tailwind on Patriot’s Day, London is a much faster course than Boston. Last year 0 pros broke 2:10 at Boston, while the top 10 finishers in London were all under that mark. 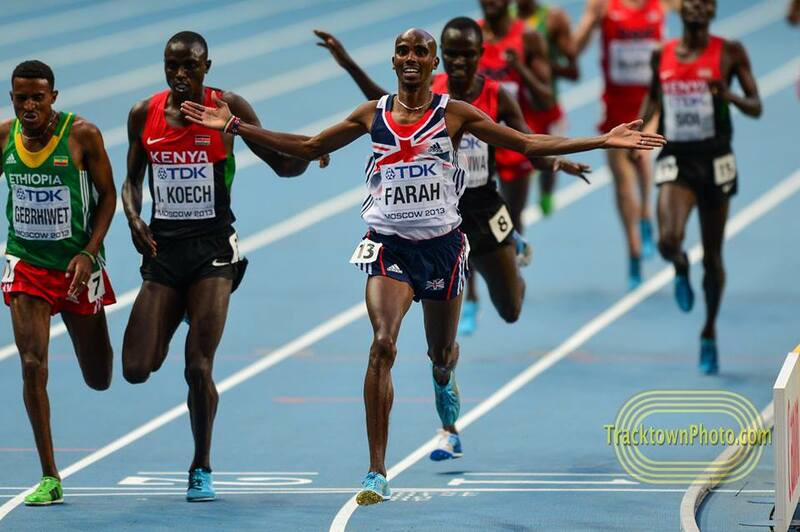 So when you say Brits in London, you really mean Mo Farah. And yes, I think he will go under 2:10. Barring an act of nature, no American will match that feat in Boston. Unless the karma of shirking his civic obligation and skipping jury duty catches up with him, American Ryan Vail could be very close to hitting that time in London. I believe the eventual winner will take the lead at around mile 24, so I’ll pick the over with you. “Dan from the UK” was watching the world feed of the NYC Half, so he heard Toni Reavis on the broadcast, not the local crew (which was Carrie Tollefsen and some NYC talent – Jon Steele?). Carrie and Jon had splits and announced them: I was passing the numbers to them. Toni should have been on the same loop; I’m not sure why he wasn’t. And I was going to mention that G. Mutai does indeed pronounce his first name “Joffrey” but then I kept reading and saw you already had my correction. While it might seem odd to those used to hearing that spelling as “Jeffrey” I would point out that in Connecticut the Thames River is pronounced (correctly) with a theta sound, so spelling is not always destiny.